ReadWriteWeb: "Augmented Reality: Here's Our Wishlist of Apps, What's On Yours? ", scans through future and current uses of AR, and is one more sign that AR is becoming mainstream. Total Immersion creates an augmented reality application for Nike, though I can't find it over here. And Total Immersion is also behind this AR web/kiosks application for France's SNCF train system (via Developement memo for ourselves). Google's has it's own version of Photosynth (and I guess they are not developing it for the sake of pure research). AR around the world: A German ad for Samsung mobile phones is using AR, and that's about all I can tell you since I don't speak German; Augmented Vision is a design project from the Netherlands that resembles Snaptell; A Japanese augmented Olympic game (via DMFO); And when it comes to this Indonesian application, I can't tell you anything at all. Techcrunch reports on a new experimental augmented reality application by Japanese telecom company KDDI, named Jitsukuukan Toushi Keitai, which according to Techcrunch translates to "handset that allows real space transparency". This app shows you icons and text labels standing for landmarks visible at the direction you are pointing your phone, as detected by GPS and compass readings. So is it augmented reality? After all, although we consider such applications as Layar and Wikitude as AR applications since they overlay information on top of the phone's video input, they don't really do much with it. As far as I can tell, SREngine is the only similar application that has some form of image processing within it. And there are plenty other "video-less AR applications" around. I for one, think of them as (primitive) augmented reality applications, but don't fancy them too much. They do fetch information stored on the cloud relevant to your current position, augmenting the physical world, but they curtail efforts to improve registering and identification of objects and landmarks. That's why I usually don't cover them. Would you? It was bound to happen. As augmented reality becomes more and more prevalent, it was all a matter of time till someone took credit for something he is probably not entitled for. Enter Chris Hughes best known for jailbreaking the first iPhone. Last February, at TED palmsprings, Hughes briefly showcased his work that "makes creating 'augmented reality' a cinch". If this demo looks familiar to you, you are not alone. Ralph Hauwert, a Papervision3d developer, took offence at Hughes talk, and subsequent interview. According to Hauwert, Huges is taking credit for porting ARToolKit to flash, while he only took FLARToolKit and "followed a tutorial like this one from the FlashBlog, then gathered all his courage and energy to work with 2 opensource projects and take credit for it" (source). Apparently, TED folks are working to fix things up. Till then, you can find more details over Hauwert's blog. Engadget brings us a hands-on review of SPRXMobile's Layar. Things to notice - only one layer is visible at a time and the user chooses the distance of the farthest points visible by Layar. Hi Dad! An Augmented Reality Father's day gift from Mangrove on Vimeo. Have a good father's day, and a great week! A lot of folks think it will be tourist applications where there’s models of times square and models of central park and models of Notre Dame and the big square around that area in paris and along the river and so on, or the models of Italian and Greek history sites - the virtual Rome. As those things start happening and people start building onto the edges, and when Microsoft Photosynth and similar technologies become more pervasive you can start building the models of the world in a semi-automated way from photographs and more structured, intentional drive-by’s and so on. So I think it’ll just sort of happen. And as long there’s a way to have the equivalent of Mosaic for AR, the original open source web browser, that allows you to aggregate all these things. It’s not going to be a Wikitude. It’s not going to be this thing that lets you get a certain kind of data from a specific source, rather it’s the browser that allows you to link through into these data sources. Do you want to play with AR, but too afraid you don't have the required programming knowledge needed? Now you have two applications to play with from the comfort of your own home. First is Metaio Unifeye Design. Available freely in an (almost fully featured) demo version, this tool is far from being a toy. You can create elaborate scenarios of marker based and marker-less image based augmented reality without writing a single line of code. You can test your creations with your web-camera or using a prerecorded video clip of a marker. There's even a tool for creating new markers. However, such flexibility does come with a price. I had a hard time working with the user interface beyond the basic functions, and I'm quite sure I only scratched the surface of what's possible with this tool. That's why I had this application installed for about a month now, but I was hesitant about writing anything about it. Metaio claims that video tutorials are coming shortly, and I think they are very much needed (and I'm a programmer in my spare time :). In more somber news, you can't use your own 3d models, or export your scenarios as a stand alone application. You probably have to pay for those features. Now, if Metaio Unifeye Design was a bit too complex for you, the next application is truly augmented reality for beginners. 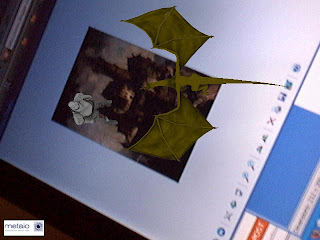 It's called Atomic, and it wraps ARToolKit to give you the basic functionality of augmenting markers with VRML 3d objects when you examine them using your webcam. The application source is available to download as well, so eager programmers may add more features to it in the future. Another advantage of this tool is that it allows you to import and use your own models. However, don't expect to amaze any AR veteran using it. Yet another quick post, just before I go to (my real) work. Sony is developing its own AR game for a camera enhanced PSP, named InVizimals. A combination of GhostWire and int13's Kweekies, players have to hunt around their houses for monsters, and later can set the monsters to fight each other. I really like how they combine the player's real world actions (casting a shadow, shaking the PSP, etc.) in the gameplay. "Currently several companies have already signed up for Layar and will publish their own content in their branded layer soon." My educated guess is that they are using the compass+gps combo to identify points of interest. First, it works only on Android devices since "they are the only devices with a compass". Then, "We have a little indicator showing you the accuracy of the location positioning", which could be avoided using computer vision. If that's the case, the main difference between them and Wikitude is having many content layers (which also justify their "first mobile browser" slogan). Whatever is the case, seeing SPRXMobile previous projects, I'm sure this one will be a tight application with a lot of promise. Good luck guys! (Raimo, Maarten, feel free to comment).